originally wrote in 1995. Posted on March 11, 2011. The girl likes sports, but her school has no sports program for girls. In seventh grade, she heads a petition drive, requesting the school board to start girls basketball. This petition drive is conducted decades before photocopy machines, computerized word processors and laser printers. As a child and young adult, the girl often thinks of herself as a troublemaker. She does not realize that her family and school do not have adequate outlets for her energy . 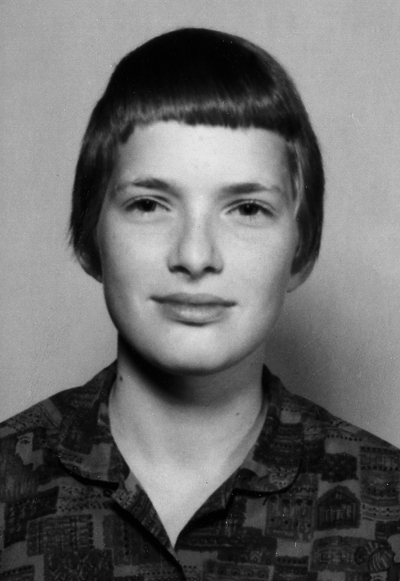 . . nor has it dawned on her that the circumstances at home and in her rural community contribute to her restlessness. Nor does she value her perceptions. Perceptions that see injustice. At the beginning of each school year, the grade school teachers ask the boys to go to the first floor supply room to bring back the stacks of textbooks that will be distributed to the students for the year. The girls are to remain seated at their desks. In sixth grade, for physical education, the head high school basketball coach comes to the classroom early and gets the boys. The guys go to the locker room, change into their white gym shorts and T-shirts and put on their Converse tennis shoes, then have a full-scale class in the new gym on the basics of basketball. Near the end of the P.E. hour, the sixth-grade teacher takes the girls to the gym, lines them up in single file, in their school clothes (skirts and dresses) to shoot free throws at one of the side baskets. What miffs the girl even more is that part of her hour of P.E. has been robbed. It is a disgrace, like being in prison, to sit in that sixth-grade classroom on the second floor near the superintendent's office two-thirds of the P.E. hour while the boys get their workout with the head coach. But to add insult to injury, the teacher requires the girls to count two points for each free throw they make. And the teacher does not acknowledge the girl is right when she says a free throw counts for only one point. The girl and two seventh-grade classmates write the petition on school-lined paper out of a spiral notebook and approach the other seventh-grade girls in the hallway during the noon hour. They get eleven signatures which means that over half the girls in the class support their efforts. The list is written in pencil along the left margin of the page under the simple sentence across the top. It is in the best of junior high language and contains no phrases of "whereas and thereby." It is less complex, but only by a degree, than the statement that the nation and state refuse to endorse in her adult years that would have ensured that opportunity under the law would not be denied due to one's gender. These girls have not heard the term "suffragette" nor do they know their school had sported a girls basketball team in the early part of the century. 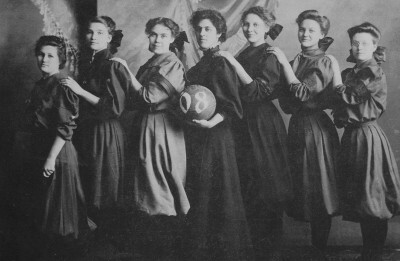 The obstreperous one has never seen the photograph of her great-aunt and teammates, lined up in their bloomers and sailor shirts, holding the basketball, painted with white letters that say "RHS 1908." Nor can she predict, that her youngest sister, ten years behind her, will be a starting guard and go to the state tournament with the school's basketball team while she is in the early part of her career teaching physical education in Duluth, Minnesota. These seventh-grade girls, in a town of 800, in northwest Iowa, who seek a single page full of signatures over the noon hour, know they are getting the short end of the stick. They make their petition specific. They address the letter to the school board and begin with the salutation, "Dear Sirs." Their statement follows, written in a mere sixteen words. "We, the undersigned, request that Rolfe Consolidated Schools begin to have an interscholastic girls basketball program." The eighth-grade boys lure the group into letting them help with the petition. The girls do not trust the boys, but the boys assure them of their good intentions. However, when the girls hand their sheet of paper to the boys, the boys tear it up. The girls start another petition and mail it to the board. Mr. Ralph Mortensen, the superintendent at the schools throughout the 1950's, the years that the obstreperous one is in kindergarten through junior high, calls her into his office to relay a message from the board that it has gotten the petition. He says, "Now this doesn't mean that the board says you can have basketball or not. It just means that they want you to know they got your petition. However, it may be that as you get older, you will realize that there are good reasons why girls shouldn't play sports." The girl says nothing. Fortunately, two years later, her school consolidates with the Des Moines Township High School that already has a girls basketball team. Mr. Mortensen moves to another school. The girl is in ninth grade and gets her opportunity to play basketball. There is uncertainty. The players from the township school have competed before, but the others do not have an inkling of what to expect either in practice or at an actual game. There is a full range of girls, freshmen to seniors, who have long been denied the right to play but now are anxious to have their day on the court; however, they go through the early weeks of practice, not knowing who will make the cut and get to take home uniforms. There is also smugness. She does exactly as she is told and catches onto drills easily and is able to run the plays smoothly. She is a bit cocky, anticipating how well these plays will work against other teams. The day comes for the coach to hand out the uniforms. He stands in the center of the gym while the girls sit along the end line. He reads the names of the players one at a time. Those who make the cut join him in the center circle. Those who don't get to go home. The night of the opening game comes. It's a road trip. The girl gets to play most of the junior varsity game. Not only does her team lose but she feels lost in the locker room after the game. She is surprised when the coach comes to her and says she should prepare to join the varsity squad for its game. Even though she sits on the bench, the idea of making the varsity gives her a spark of joy in an otherwise desolate evening.Beginning her sophomore year, she gets to be a starter on the varsity squad because one of the leading scorers who had come in with the township team had gotten pregnant and had to leave school. However, in all her high school years, the girl's team wins only a handful of games, playing against successful teams in the conference who had decades of basketball history behind them. There is one game, a road trip to Twin Rivers, that is devastating, not because it is that much worse than other games, but because the pressure of losing so many times has accumulated to a breaking point. No matter how well practice has gone or how much her team has improved, it cannot penetrate the opposing defense. The Twin Rivers guards anticipate every move and are not fooled by a head or body fake. They prevent the forwards from entering the free throw lane and getting close to the basket. They block shots and intercept passes. In essence, they shut down whatever offense that the girl and her team mates have developed. After the game, the girl goes by herself to a side section of the locker room. She is in no hurry to get dressed and does something she has never done before. She sits on the floor in the middle of a pile of towels, duffle bags, street shoes and clothes, her legs folded with her knees tucked against her chin so she can fit between the row of metal lockers and the dressing room bench. It is an awkward place to be but the only place to withdraw. She begins to cry then bawls. Her face is red. Tears stream down her cheeks. Eventually she picks herself up, showers, dresses and heads for the bus with the rest of the team. Nothing is said. Several days later at home, after the girl cleans her room and does her other required Saturday household chores, she scampers downstairs to the living room to check in with her mother before heading out doors. Her mother stops her and wants to talk. She says she has heard that the girl cried after the game at Twin Rivers. 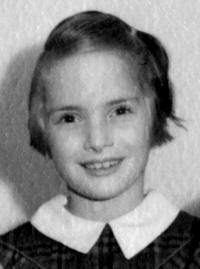 The girl wonders how her mother knows what happened but says nothing. Her mother continues, "We don't cry about things like losing a ball game." The girl remains attentive, albeit quiet, a proper amount of time for the conversation to conclude without being abrupt or rude, then continues on her way to be out and about the farm with her horse. As a high school senior, she realizes she has only one year remaining to make good at basketball. One night late in the fall, after the basketball season begins, she goes out by the garage where there is a post and basketball basket at each end of a rectangular, concrete parking area. It is the family basketball court. In the cool, harvest air, that has a hint of winter, she practices long and hard. She does lay-ups, making a loop from the basket at one end to the basket at the other. She is concerned about how little spring there is in her jump. Each time around, she tries to leap higher but cannot go higher. The rest of the family has gone to bed, but she stays out under the yard light. One more lay-up along the baseline, she says to herself, and she will go in. She goes for the lay-up, but comes down hard, turning her ankle on the edge of the concrete where it drops off and becomes grass. She is in great pain, swears at herself, then manages to hobble into the house and up the stairs to her bedroom. The next morning, her ankle is swollen and purple. She cannot stand on her foot or get ready for school. She has to tell her mother. A trip to the doctor. X-rays, an ace bandage and crutches, Epsom salts and hot water. The ankle begins to heal. The coach wraps it with many layers of adhesive tape. The girl plays but sprains her ankle two more times during the season, once at practice and another during competition. The game at Pocahontas is going well, but she trips over her own feet, turns the ankle, and crashes to the floor. She slams her sweaty palm on the varnished wood in anger and frustration. She gets to her feet, is helped to the bench, puts ice on the ankle, and sits out the rest of the game. She is put on crutches again and misses more games. As she sits as a civilian in the bleachers and watches her teammates in action, she isn't sure she wants to play any more. The season is sliding by with little prospect of winning, so what is the use. Her basketball career is nearly over with no sign of success. The girl returns to competition, and her team wins three games before the season is over, but she realizes it is hard to make the short jump shot. It's especially frustrating when she is in the open under the basket. She runs the play perfectly, faking out her guard, rolling off the screen, moving to the left of the lane, getting the long pass from center court, but clutches. She sees the rim. A big circle. An easy shot. But in that split second before she releases the ball, she thinks, "I'll probably miss." And she does. At fifty, she goes to her school's all-class reunion where multiple generations of her hometown clan gather. The only speaker is Mr. Mortensen. She wants to stand up, like at a press conference, and demand that he respond to her question. 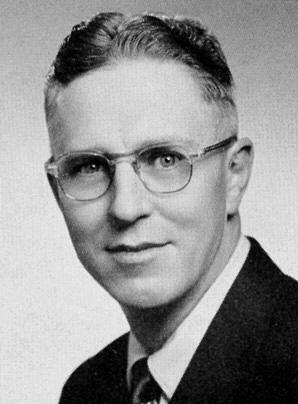 To insist that he explain what he meant by those remarks he made in 1957. To demand an apology. But of course she doesn't. What would her classmates think? What would her parents think? What would she think of herself? 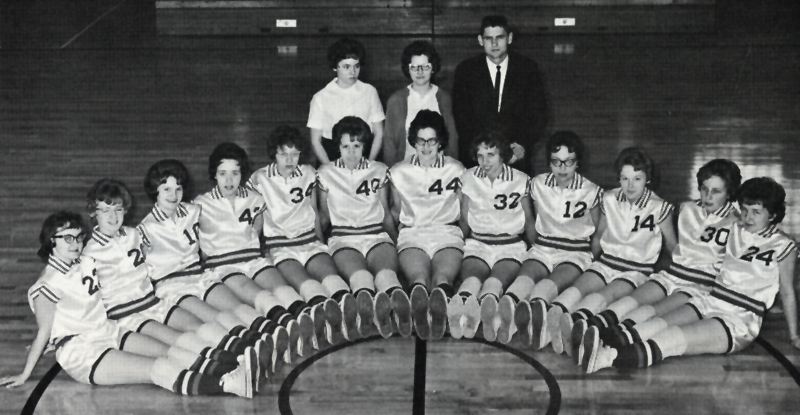 Rolfe High School 1963 girls basketball team. 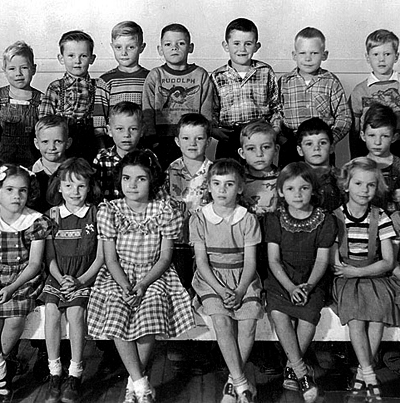 Front row, left to right: Linda Leadley, Diane Callon, Joann Bennett, Phyllis Pedersen, Debra Johnson, Kaye Smith, Helen Gunderson, Shirley Bennett, Carol Biedermann, Chris Trimble, Geraldine Baker, Diane Trimble. Back row: managers Ann Cleal and Sharalyn Wolf, coach Jack Head. 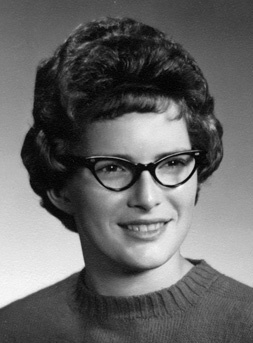 Many thanks to the Iowa State University Special Collections Department for having Helen's photographs and other materials be part of its collection and for assistance in locating and scanning two of the photos used in this piece. The department is located on the fourth floor of the Iowa State University Parks Library.